CAO Colombia is another great hand-rolled premium cigar from the World Blend Series by CAO cigars. Each of these gems are created with prominent rare Cuban-seed tobaccos, consisting of a Cameroon binder with Brazilian Mata Fina and Colombian Ica Mazinga long fillers, held perfectly together inside a golden brown Honduran wrapper from the Jamastran Valley in Honduras. 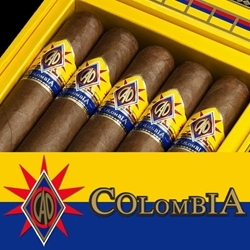 CAO Colombia premium cigars are mild-medium in body and medium-full in flavor. The delicate mixtures that infuse these handmade cigars boast of hearty flavor profiles of cedar, earth, and pepper, producing a savory smoke that burns beautifully and smokes effortlessly. Every CAO Colombia purchased on our online cigar store can be delivered right to your front doorstep. Smokers Discounts has made it easy and affordable to buy premium cigars online. A variety of sizes and flavors are listed below at our discount online cigar store. Each of these styles are in stock and available. Call us for more details!